The Road to Khufu VIDEO – Coming Soon! I recently had the opportunity to explore one of the Cairo2050 projects with members of the New Media Task Force at the School of International and Public Affairs at Columbia University. We will soon be launching a video outlining and detailing the impacts of this irresponsible construction project. Meanwhile, please read on to find out more , and as always please share your thoughts. 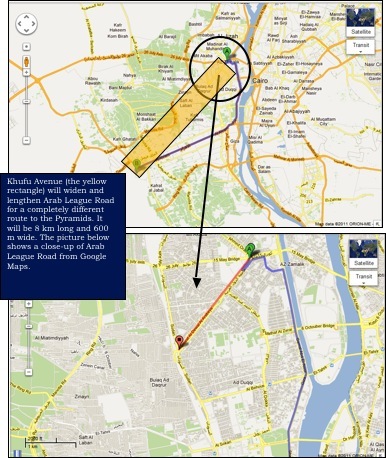 The project proposes the extension of the Arab League Road by 6 km and its widening by 540 meters of residential area. 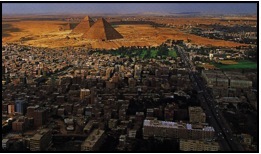 Khufu Avenue’s construction will require the rarefaction of the Buulaq el Dukrur region – an area with one of the highest densities in Cairo – among other neighborhoods in its way, consequently causing significant displacement and segregation of informal areas from business and tourist areas. There is currently no relocation plan for the residents who will be forced to leave. Many of the affected residents have lived in their homes for generations and depend on the social cohesion of their community. The Khufu Avenue proposal is another example of the previous regime’s neglect of the people’s needs. Dana Kardoush is part of a team analyzing governance over land in Cairo for Columbia University and the Institute for Research and Debate on Governance. This reminds me of Tim Mitchell’s essay Dreamland, the Neoliberalism of Your Desires. Dreamland was the name for a new expansion of Cairo in the 1990s and for Mitchell it is a symbol of the essence of neoliberalism, on the one hand the balance sheet, monetary discipline, on the other encouraging “the most exuberant dreams of private accumulation”. Thank you for writing this post. I can’t wait to see the video. When will it be online?